Albert Einstein was my ultimate choice when it comes to the person i adore the most or follow by heart. He was such an amazing human being along with being super-genius of course. So here we reveal some amazing facts about his life. 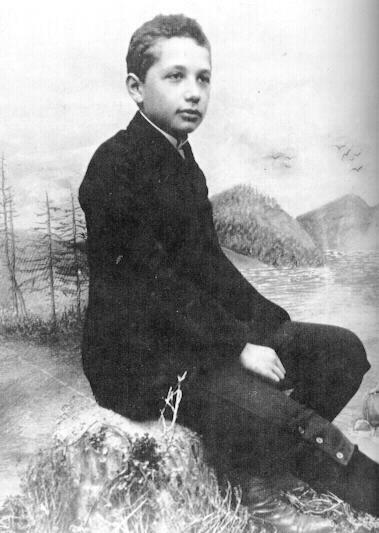 Einstein was born on 14th March 1879 and died on 18 April 1955. He was born in Germany. He is best known for his theory of relativity and specifically mass–energy equivalence, expressed by the equation E = mc2. Einstein received the 1921 Nobel Prize in Physics “for his services to Theoretical Physics, and especially for his discovery of the law of the photoelectric effect. During his stay at the Patent Office, and in his spare time, he produced much of his remarkable work and in 1908 he was appointed Privatdozent in Berne. In 1909 he became Professor Extraordinary at Zurich, in 1911 Professor of Theoretical Physics at Prague, returning to Zurich in the following year to fill a similar post. In 1914 he was appointed Director of the Kaiser Wilhelm Physical Institute and Professor in the University of Berlin. He became a German citizen in 1914 and remained in Berlin until 1933 when he renounced his citizenship for political reasons and emigrated to America to take the position of Professor of Theoretical Physics at Princeton*. He became a United States citizeAfter his retirement he continued to work towards the unification of the basic concepts of physics, taking the opposite approach, geometrisation, to the majority of physicists. 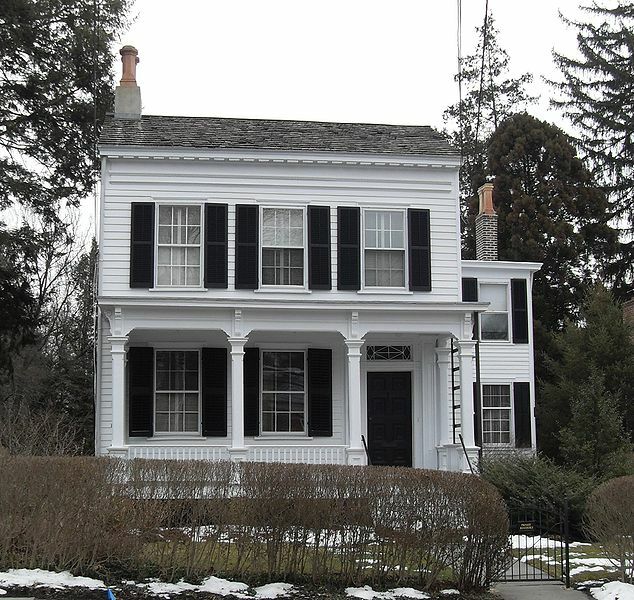 The picture shows Einstein’s home in US.In 1922 Einstein was awarded the 1921 Nobel Prize in Physics, “for his services to Theoretical Physics, and especially for his discovery of the law of the photoelectric effect”. This refers to his 1905 paper on the photoelectric effect: “On a Heuristic Viewpoint Concerning the Production and Transformation of Light”, which was well supported by the experimental evidence by that time. The presentation speech began by mentioning “his theory of relativity [which had] been the subject of lively debate in philosophical circles [and] also has astrophysical implications which are being rigorously examined at the present time.” (Einstein 1923)After his retirement he continued to work towards the unification of the basic concepts of physics, taking the opposite approach, geometrisation, to the majority of physicists. The picture shows Eeinstein with Poet Rabindranath Tagore. Many of us still don’t know this but still today the brain of einstein is kept safe. Einstein’s brain was preserved after he died in 1955, but this fact was not revealed until 1978. 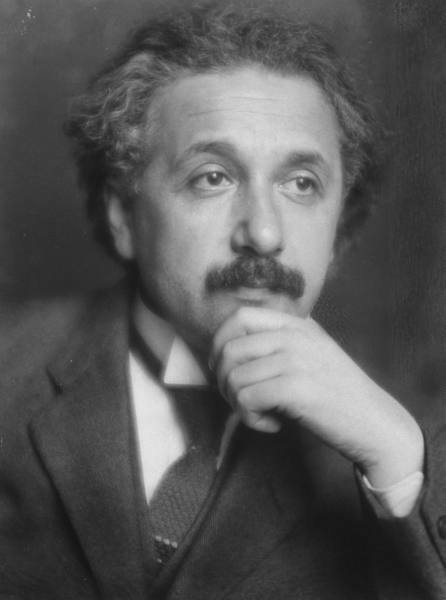 Albert Einstein‘s brain has often been a subject of research and speculation. Einstein’s brain was removed within seven hours of his death. 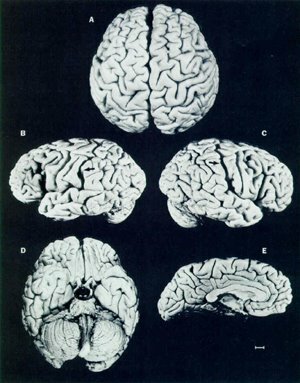 The brain has attracted attention because of Einstein’s reputation for being one of the foremost geniuses of the 20th century, and apparent regularities or irregularities in the brain have been used to support various ideas about correlations in neuroanatomy with general or mathematical intelligence. Scientific studies have suggested that regions involved in speech and language are smaller, while regions involved with numerical and spatial processing are larger. Other studies have suggested an increased number of Glial cells in Einstein’s brain.Albert Einstein died at 1:15 am on April 18, 1955 at Princeton Hospital in New Jersey. Later that day, Princeton Hospital pathologist Dr. Thomas Harvey performed an autopsy on Einstein and removed Einstein’s brain. Harvey cut the brain into 240 pieces. He was very protective of the brain and kept it jars at his house. Over the years, Harvey gave several pieces of the brain to different researchers including Dr. Marian Diamond (UC Berkeley), Dr. Britt Anderson (University of Alabama) and Dr. Sandra Witelson (McMaster University, Hamilton, Ontario). Harvey moved around the country and he always brought the brain with him. Eventually, Harvey moved back to New Jersey. In 1996, Harvey brought the remaining pieces of Einstein’s brain to Dr. Elliot Krauss, chief pathologist at Princeton Hospital.